The book is written by Dr. Wolfgang Messner; he is Associate Professor at MYRA School of Business and Director of GloBus Research. He regularly advises organizations seeking to create value and grow their business by making strategic choices. 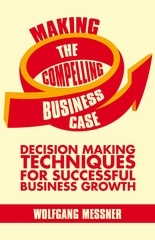 He has now crystallized his experience and expertise in this hands-on book, meaning that you can build compelling business cases on your own and take the right decisions for your business to grow and prosper. "Messner has distilled his academic and business experience into a fine contribution." Every page of the book contains useful ideas, practical frameworks, and real-life examples. It offers complete coverage and contains all the topics that one would expect to see in book on business cases, including modern topics such as simulations and strategic flexibility options. "A useful, pragmatic, how-to-do-it book." Given that business managers and students alike notoriously struggle with finance, Messner's clear and engaging writing style, borne out of his vast experience, makes the subject-matter easier to understand and more accessible for the reader. "Messner brings the voice of experience resulting in a clear, comprehensive, and up-to date guide"
The book is specifically written for business managers who need to grow their business (units) by taking the right corporate investment decisions and members of the CFO's office who need to appraise business cases. Account managers and sales consultants will be introduced to the spirit of business case selling helping to avoid confusion and a neglect of value in the sales process. "Belongs at the top of the reading list of account managers." This book provides necessary background information, hands-on tools, worked examples, and real-life case studies. If the choices between alternatives are not obvious, if funding decisions have a significant impact, and if investment decisions need to get the buy-in of senior management and many stakeholders, then this book is designed to help realize and maximize value. "This step-by-step guide to comprehensively evaluate alternatives will help managers think through their plans." MBA students will find the book academically sound and at the same time grounded in corporate reality. "It offers serious students a deeper dive into key areas." Now find out what is in the book!